@Miss_Cybernaut and couple more twitternauts have discussed last night and I think we all agree that .wtf would be a perfect top level domain for Serbia, instead of .rs. 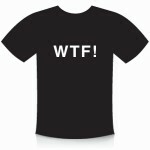 .wtf, of course, comes from “What The F..K! ?” as it is a phrase we use after almost every news item that we hear or read. This one amazed me and I used WTF several times – Tomislav Nikolic, leader of the new conservative political party in Serbia (which was established recently after Nikolic and Vucic left Serbian Radical Party), and the guy most of us are afraid to win some future elections, apparently visited EU officials and promised to start an EU Integrations Council. This would be great news if we could forget that he was leading the political party that was openly agitating for “Great Serbia” (the one that includes half of Croatia and most of Bosnia) and the same party that was openly supporting paramilitary troops in wars in Croatia and Bosnia which were doing things most of Serbs will feel ashamed forever. And while I was screaming WTF WTF WTF WTF, a friend from Macedonia has put this video below on his facebook page, and I couldn’t stop WTFs coming out from my mouth… Check it out and tell me if this is a Union we want to join?